A couple of days ago, I found a little treasure. Atleast to me it feels like one. I've always loved collecting recipe books or recipes from all over the place in the hope of trying them out someday. About 5-6 years ago, before I'd ever even thought about blogging, I'd printed out a bunch of recipes and filed them, and with time, the file kept growing, but I never really got around to trying too many of the recipes. (The only downside to it was I never really thought about documenting the source of these recipes, so unfortunately can't credit the source. I will try to hunt them down but haven't had much luck yet.) Then with the many tasks that occupied my day, not to mention an extremely stressful job, taking care of my home, moving from one house to another, and so on, this precious file of mine somehow fell off my radar and ended up in the deep dark recesses of my book shelf. This my friends, is what I found the other day. I was quite excited and quickly perused through it looking for vegetarian options and to my delight, I found quite a few. 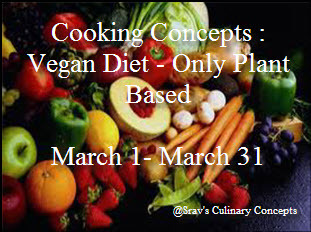 The first one that I tried was the Rajma Masala or Kidney Beans Curry. I've tried a couple of recipes for curried Kidney Beans in the past, but this one is my husbands favorite and considering the fact that he doesn't like kidney beans, that says a lot. I loved the simplicity of the recipe. This one is a keeper. Soak the rajma in water overnight or alteast for 4-6 hours. Drain, rinse and cook the rajma in fresh water till it is tender. I pressure cook it for 10-12 minutes on slow fire after the first whistle. Drain the beans and reserve the liquid. Grind the onions, ginger, garlic and garam masala powder to a paste. Heat the oil in a pan and add the cumin seeds and let them sputter without burning them. Add the onion paste. Saute it till the paste has cooked off and the oil separates. Add the chopped tomatoes and continue to saute till the tomatoes are soft and have incorporated with the onion paste and the oil starts to separate. Add the turmeric powder, chilly powder, coriander powder and stir well till mixed. 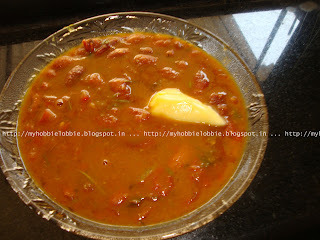 Add the green chillies and the beans and stir gently to avoid mashing the beans, making sure the spices coat it well. Let it cook on high heat for a couple of minutes. Add the reserved liquid that the beans were boiled in till you have reached the consistency you like. You may not need to use all the liquid or if your reserved liquid is not sufficient, you can add water. Bring to a boil and simmer for about 10-15 minutes. Lastly take it off the heat and add the chopped coriander leaves. Note: Sometimes this is served with a dollop of butter on top. I love the combo too Deepa, thanks for stopping by! I can't wait to put all those wonderful spices together for this awesome dish. I can almost smell it cooking. Hope you are having a great week end and thank you so much for sharing with Full Plate Thursday. I hope you enjoy this dish Miz Helen! Thanks for stopping by! Wonderful and tasty gravy !! perfect with rice and rotis !! Thanks for linking to the event !! Thanks Sravs ... I can't wait to see the roundup! Thanks Jess. I'm so happy u liked it!